Equally interested in academics and co-curricular activities, Divya shows remarkable ability in them all and often participates in various contests. The young girl, whose father is a house painter and mother a paper mill worker, likes attending school and does not want to miss a single day of school. “At school, we can study, play, learn new things and have nutritious meals. Besides that, there are events like drawing competition, Sports Day, dance competition. I participate in almost all the competitions because it helps me learn and have fun. I am especially fond of Kho-kho and dancing,” explains Divya, who is the youngest of three sisters – her elder siblings study in Std X and Std IX. Divya likes Akshaya Patra’s ‘warm and nutritious food, comprising rice and a variety of vegetables’. She adds, “Some of us don’t get food from home and can’t afford to eat outside, so the food provided by Akshaya Patra is important to us. Without it, we’ll feel hungry and won’t be able to study.” She further states, “It is this food that gives me the energy to concentrate and the enthusiasm to dance.” Her fondness for the Foundation’s meals are evident when Divya goes on to list several items on the menu, such as her favourite – Dal Chawal, khichdi, roti, Naan Khatai and more! 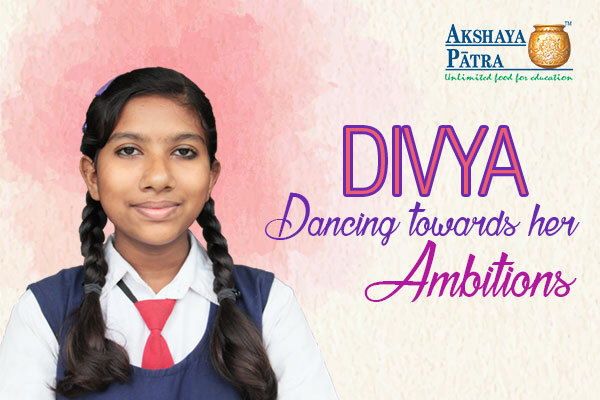 We wish Divya the very best and hope she dances away towards the fulfillment of her aspirations!